Missourians of a certain age may remember Jean Bell Mosely, and those who are not of that age should learn about her. She was a prolific writer whose work was characterized by a gracefulness of style and a clarity of observation that many of us would envy. 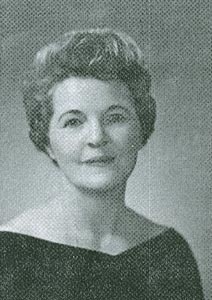 Her work was conventional in the sense that it stayed within accepted social norms; she was an exceptionally good citizen in the community where she spent most of her life, Cape Girardeau, a churchgoer and faithful alumna of Flat River Junior College (now Mineral Area College) and Southeast Missouri State College (now University), having been the valedictorian at both Doe Run High School and the junior college. So you won’t see her name in the list of ground-breakers. But her devotion to craft and her exceptional observativeness are exemplary. Her stories were published in Woman’s Day and The Saturday Evening Post in the 1950s, and her books, six in all, came out from the Fifties through the Eighties. She died in 2003 at age 89. But the way most people in Southeast Missouri experienced her work, I suspect, was in her newspaper column “From Dawn Till Dusk,” which appeared in the Southeast Missourian and was frequently republished elsewhere. She and another Southeast Missouri writer, Thomza Zimmerman of Advance, alternated columns, and they were eagerly read throughout the region. Mosely’s close observations of nature and of human nature were particularly insightful. She began writing the column in 1955, and the last one was published five days before her death. How’s that for meeting your deadlines? In that final column, she mused about how the clothing worn by the various caregivers at her medical facility reflected their personalities and perhaps their unspoken wishes. I hope I am still writing in the week before my end, and if I am, I’ll try to remember to end whatever I’m working on with the word that Jean Bell Mosely used to conclude every column: Rejoice!